Completely self-contained, self-supporting and economical to own. Durable, high quality construction ensures safe, reliable long-term performance. Capacity of 300 or 500 lbs. with 3' x 3' carriage. Travel speeds of 20-40 fpm. Mechanical motor/gear reducer with frequency drive provides soft start and soft stop. Carriage decelerates to stop position which extends brake life. Allows loading and unloading from three sides at each level. Access gates are provided at each level and interlocked with lift operation. Gates are modular and can be configured to hinge right and lock left or hinge left and lock right. 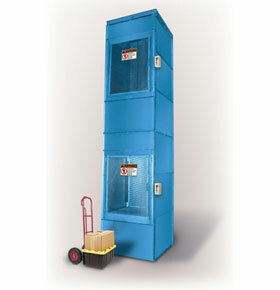 Unlike similar lifts in the industry Series B Lift is ASME B20.1 Code compliant.